Feds Move To Curb Abusive Debt Collection By Nonprofit Hospitals : Shots - Health News The Treasury Department has proposed restrictions on debt collectors, required under the 2010 federal health law, to protect patients at nonprofit hospitals. A Supreme Court ruling that strikes down the entire law would scotch the new rules. Deb Waldin was in agony when she arrived at the emergency room of Fairview Southdale, a nonprofit hospital in suburban Minneapolis. On a scale of 1 to 10, she says her pain was at 12. She turned out to have kidney stones. But before she got the diagnosis, while she was still lying on a gurney waiting to see a doctor, she was approached by a debt collector from a company called Accretive Health. 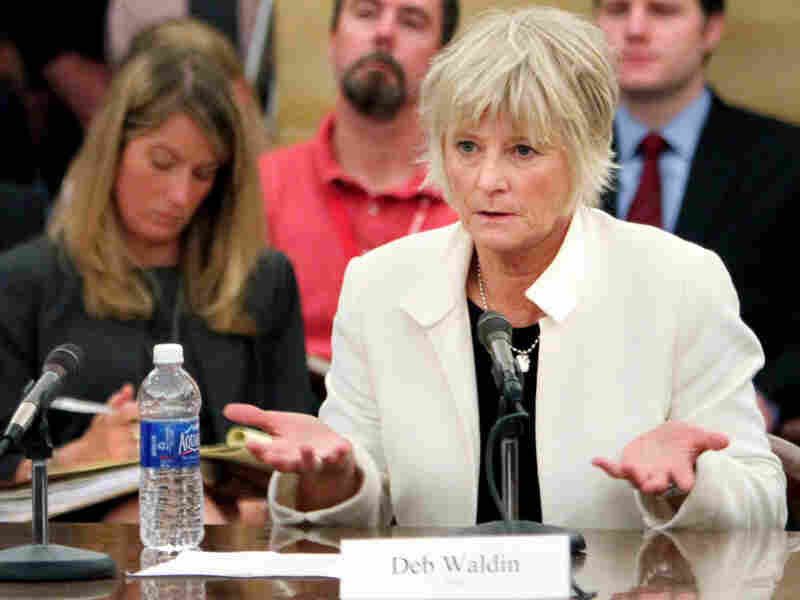 "I was in a little ball in the fetal position wishing I could die," Waldin testified at a recent congressional hearing. "I saw out of the corner of my eye this little guy wheeling a [cart]... I was just having such pain it was hard to process what he was saying, but I do recall he said I had to pay him between $700 and $800." On Friday, the Treasury Department proposed rules, required under the 2010 federal health law, to protect patients from abusive debt collectors at nonprofit hospitals. "In recent months, we have heard concerns about aggressive hospital debt collection activities, including allowing debt collectors to pursue collections in emergency rooms," Acting Assistant Secretary for Tax Policy Emily McMahon said in a statement. "These practices jeopardize patient care, and our proposed rules will help ensure they don't happen in charitable hospitals. These rules also require charitable hospitals to establish and publicize financial assistance policies, and give hospitals the flexibility to establish programs that meet the needs of their communities." The rules are subject to a 90-day comment period. At the same hearing where Waldin testified, Accretive Senior Vice President Greg Kazarian apologized to patients about such tactics and also said that the company's actions had been distorted in the investigation. Sen. Al Franken (D-Minn.), who called for the hearing, acknowledged that hospitals face some tough times. "And hospitals deserve to be paid for the services they provide," he said. "But especially in this time of economic hardship, we need to make sure that patients aren't the unintended victims of budget shortfalls." Three out of five hospitals in the country are nonprofit. The rules say these hospitals must give patients a clear explanation of how they can get free or reduced-cost care. Then the hospitals have to give patients at least eight months to apply for it. The rules also say hospitals can't charge uninsured patients more than they charge insurers who pick up the tab for other patients. Jessica Curtis, who directs the Hospital Accountability Project at Community Catalyst, a patient advocacy organization, applauded the proposed rules. "We need to put more of the onus on hospitals to be better about being fair with patients," she said. But the American Hospital Association, a trade group, says the rules are onerous, and place too much of the blame on hospitals. "Hospitals appear to be held accountable for the activities of the third-party debt collectors that they employ," said Melinda Hatton, the AHA's general counsel. Hatton argued that if a hospital makes a mistake in the way it explains its financial assistance policy to patients, the penalty could be enormous. "You could potentially lose your tax exemption," Hatton said. The new rules are based on a provision in the health law that was championed by Sen. Chuck Grassley (R-Iowa). For years, Grassley has been scrutinizing the finances of nonprofit hospitals, including how much charity care they provide in return for their tax exemptions. "It's the hospital's responsibility to find out, 'Does this person have the ability to pay?' If they do, then get from them, what you can get from them," Grassley said. "But if they don't have the ability to pay, leave them alone. We got tired of the harassment." But, like all Republican senators, Grassley voted against the Affordable Care Act. The Supreme Court is set to rule on the law Thursday. If the court decides to strike down the entire law, the proposed rules on debt collection at charitable hospitals would disappear along with it. Elizabeth Stawicki of Minnesota Public Radio contributed to this report.